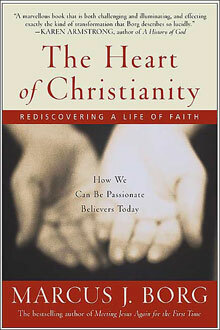 In Marcus Borg’s engaging discussion of “emerging” Christianity, the question was subtly thrust upon me: Do you believe in Christianity—its tenets, teachings, dogmas, doctrines, traditions, and injunctions—or do you believe in God? Let it be said that emerging Christianity, as Borg describes it, is far less concerned with rule-based religion and far more concerned with the God-man relationship. But what struck me in Borg’s parsing of both emerging Christianity and early Christianity was the subject of faith/belief. Early Christians were said to believe in Christianity; emerging Christians believe in God. Now that is not to say that early Christian don’t also believe in God, but what guides them in their faith are the tenets of the church on earth—the organized religion which provides rules and incentives to do good works and align oneself with Christ and God. Emerging Christians are more personal and subjective in this approach, recognizing that each individual’s relationship with God must be different. Still, the two converge one one important point: belief in God. Which is an odd discussion, if considered in the light of Borg’s literal-factualism. Borg describes the early Christians—and many of the same mind exist today by his definition—as those who tend to look at the Bible as inerrant Truth, the very Word of God written for our guidance and instruction. But where the Word of God is, in this context, considered literally and accepted as both fact and Truth, it is faith that must describe, first and foremost, our relationship with God. That is to say, we cannot begin to have a relationship with God unless and until we believe in him. The paradox is simply this: If the Bible is accepted as inerrant Word of God, then there is proof of God in the words presented to us. By that logic, we need not have faith, but KNOW that God exists and that we have access to him. There is something in this that grates against me—not only the logical arguments, but the understanding and necessity of faith. Contrarily, I take this route: I believe in God. But I believe, not according to factual proof or inerrant Word. I believe because God gave me the capacity to believe. Now I am forever re-understanding God, but this does not mean that I had faith wrong to begin with. It simply means that the belief is open to reform and change. It is not God who changes, but me, and my belief. Anyone who argues against this truth by saying that God must be static is erring in arrogance. Firstly, no one knows the nature of God, and second, if anything in the triumverate of God-me-faith is likely to change and head in the wrong direction, it is me or my faith. Now this does not do particular damage to emerging or early Christianity in my view; if anything, it makes clear to me that I lie somewhere in between—a Christian who devours religious pluralism, who embraces the powerful personal relationship with the divine, yet one who says there must be some ground rules set or we can just cease to call ourselves Christian whatsoever. We must remember that religious community is established for our own needs, not for God’s; the ground rules, therefore, are not to appease God, but to guide ourselves in work and faith. Indeed, they are meant to help us lead truly Christian lives. And we need them to stay afloat. So, when I say, “I believe in God the Father, the maker of heaven and earth,” I do not really mean “I believe despite the fact that proof has not been given to me.” Really, I mean, “I believe that God is, and there is no proof accessible or acceptable to me. I believe that I need not believe at all.” God does not come into existence because we believe; quite the contrary, I think. We come into full being when we come to KNOW that God is not just around us, but within us. And that is the Christian come full-circle—whatever camp he or she belongs to.